To send a text message, simply enter a phone number and the text of your message. If the message is longer than 160 characters, the gateway will automatically use concatenated SMS (“long SMS”) message support to send the entire message. The “Message Type” would normally be set to “Normal”. Setting a “Replacement Type” value means that if the gateway sends a subsequent message with the same replacement type value, this will replace any previous messages that were sent by the same sender with the same replacement type value. When submitting an SMS message via URL parameters, replacement type values 1 thru 7 correspond to settings of PID=41 thru PID=47. “Message Class” settings are generally used only for testing, except for “Class 0 (Flash)” messages which can be occasionally useful. A “flash” message is an SMS message that is automatically opened on the display of the receiving phone, and is normally not saved to the phone’s inbox, so that once the user exits the message, the message automatically disappears. “Destination Port” is useful when sending messages to a Java MIDlet running on a mobile phone. When submitting an SMS message via URL parameters, it is possible to use the “&DestPort=” parameter for specifying this setting. 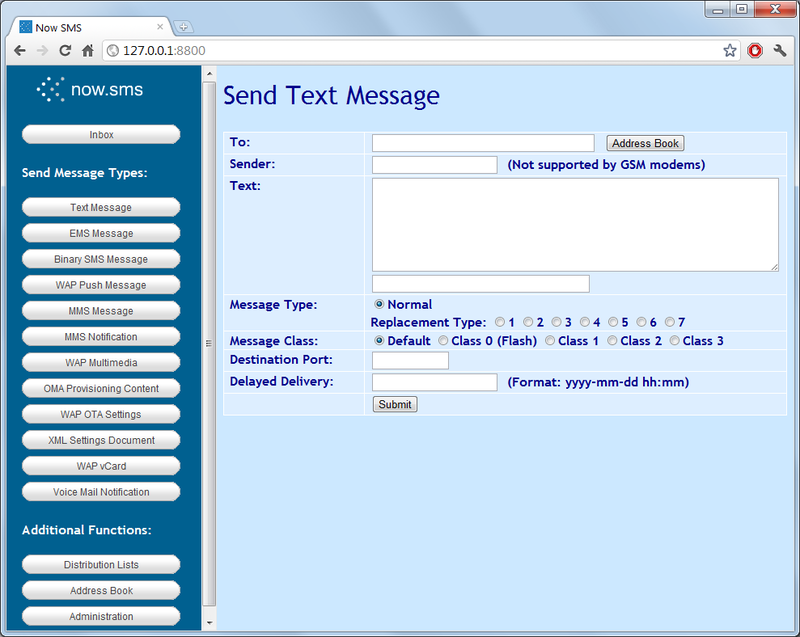 “Delayed Delivery” allows a message to be submitted to NowSMS, but queued for processing at a future date and time. When submitting an SMS message via URL parameters, it is possible to use the “&DelayUntil=” parameter for specifying this setting.